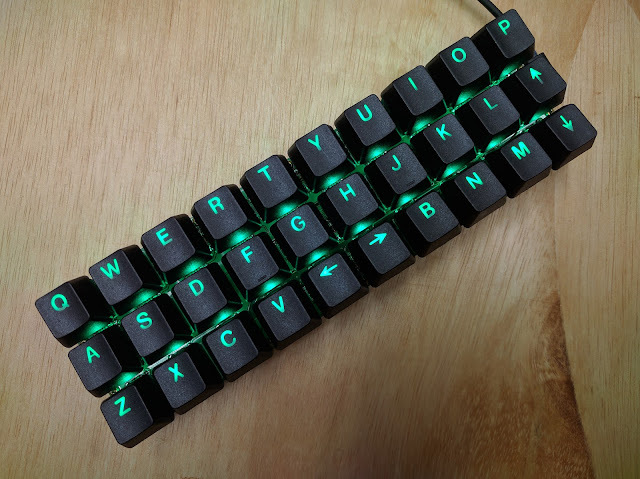 Someone in the Plover Discord Group posted a picture of a tiny ortholinear keyboard that I now want desperately, even though I already own an Infinity Ergonomic, StenoMod, SOFT/HRUF, Planck, and Sidewinder, not to mention a manual steno machine that ostensibly was once owned by Margaret Mead's stenographer. Look at this thing! It's called a Gherkin, and it's an extremely stripped down 30-key qwerty keyboard that could actually work pretty well as an ultra-portable steno machine. There aren't enough rows for a number bar, but Charley of StenoMod fame pointed out that you could map the keys to either side of the vowels to the number bar and get numbers that way. People with large hands might struggle with the crammed-in key placement, but people with small fingers like me would probably love it. It supports NKRO firmware and mechanical keyswitches, so there shouldn't be any problem using it with Plover. Like most mechanical keyboards aimed at hobbyists, this one requires assembly, including soldering, and requires you to flash the firmware manually to the board, both of which are a step or two outside my own personal wheelhouse. Plus you have to get someone to make you the PCBs. But if you're looking for a fun DIY project, this could be a really fun convertible steno/qwerty machine that almost fits in your pocket. If you wind up making one, let us know what you think. And if you wind up making two... Uh... Can I buy one off of you? Seriously, that thing is cute as heck. Hello Mirabai, there’s been a long time since I didn’t look into Plover community, but your post has definitely caught my attention, and renewed my interest. Searching into the news of Plover, I got to mention that some work C. Shattuck has done have really pleased me also. Take the 4th Annual Community Survey!